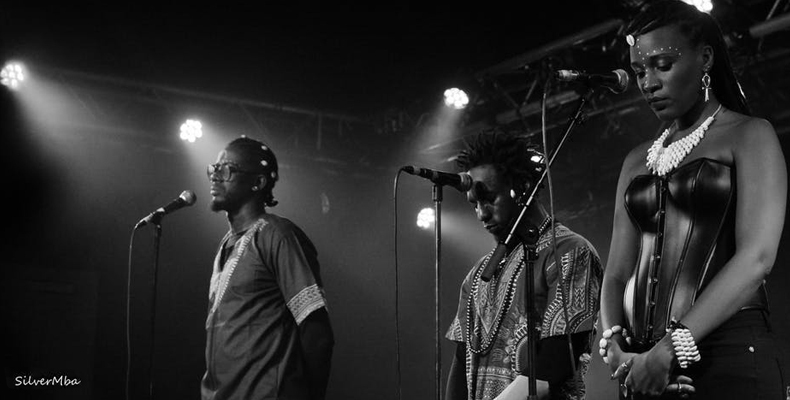 Duo Movaizhaleine and artist Wonda Wendy take a minute’s silence to honor the dead during a concert in Paris, February 2017. Everyone knows that Hip Hop was born in the South Bronx, United States, but we’re not too sure if this historic birthplace still matters to most Hip Hop artists today. Since its emergence in the 90s, the studio style has dominated the Hip Hop scene in the US and later spread to many regions across the world such as East Asia, Southeast Asia, Western Europe, South America, and Africa. This popular studio style, like it or not, has overshadowed the true form and purpose of Hip Hop. ‘Breaking’ (the precursor of Hip Hop), founded by Kool Herc in the mid 70s, was a movement to address street-gang wars and socio-economic injustice manifested in a “battle” form of art (see “Music is Art because it’s Political”). It was far from being a, sorry to say, “commodity” like the mainstream Hip Hop music we are listening to. Being mainstream or commercial is not a bad thing, as long as it is not out of context. There’s an interesting event that has happened in Gabon, Africa. Over there Hip Hop was initially treated as a trendy fashion. The so-called ‘bling-bling’, the offspring of studio style, was the first type of Hip Hop introduced in Gabon. It became so popular so it was exploited for political campaign. Over the years, Hip Hop in Gabon has transformed into a social movement and a vehicle to challenge any political unjustness. The important point here is that the commercial-turned-political Gabonese Hip Hop is a complete reversal of what has happened in the US. From a historical perspective, an art form has always been born out of socio-political context. There was never an art form that was developed from being a commercial goods first. That’s why what has happened in Gabon is an anomaly. Maybe because this is Africa? Let’s have a deeper look at what happened with Gabonese Hip Hop below. ‘African revolution’, one of V2A4’s first hits, explicitly mentions the misappropriation of public funds. Si’Ya Po’Ossi X bluntly describes daily life in the ‘mapanes’, poor urban areas where the majority of people live. The rapper Kôba is an icon of bling culture in Gabon. Presidential candidate Ali Bongo on stage with rap stars from Hay’oe, who supported his campaign. The title ‘Mister Zero’ was recorded in south of France by rapper Saik1ry who condemned Ali Bongo’s disastrous record, now an anthem at opposition demonstrations. Subversion through juxtaposition by Lord Ekomy Ndong. On the one side, rappers aligned with the Bongo family, involved in rallies and producing songs to support the incumbent party. On the other side, protest rappers, denounce increased corruption and poverty since Bongo has taken office. Alice Aterianus-Owanga is the author of “Rap Was Born Here! Music, Power and Identity in Modern Gabon”, published by Maison des Sciences de l’Homme, September 2017.